Thanks for helping make 2016 another big and exciting year for Greenlight Guru filled with growth! We hope it was for your medical device company as well. Below is our annual list of the top 10 most popular blog articles we published in 2016. Plus this year, we’ve added bonus sections with links to our top 5 most popular webinars and top 5 most popular podcasts. Enjoy! 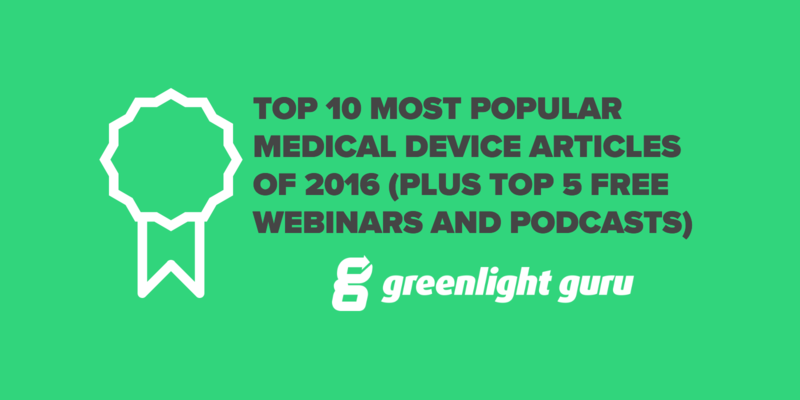 Click here to download a PDF of Greenlight Guru's most popular articles, webinars and podcasts of 2016 to save and reference for yourself later. Which piece of content did you find most valuable? Have a topic you'd like to see us cover in 2017? Let us know in the comments.